Summer time means frozen treats and people who need to avoid dairy or watch their sugar intake don’t have to miss out! 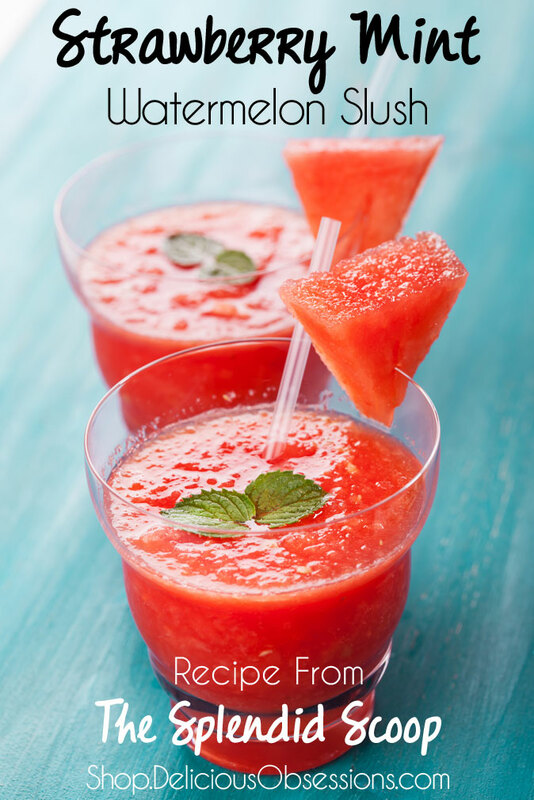 This recipe for a strawberry mint watermelon slush is from The Splendid Scoop, a new digital resource that delivers easy and delicious dairy free recipes for ice cream and other frozen treats you can make at home, even if you don’t have an ice cream maker. The author of The Splendid Scoop is Jessica Espinoza, who you may know already as the blogger behind Delicious Obsessions and the author of my favorite cookbook for coffee alternatives, DIY Herbal Coffee Substitutes. I love Jessica’s recipes because they are always delicious, easy to the point of being fail-proof, and good for you. I was thrilled to get an advance copy of her latest ebook and asked if she would let me share this recipe with you. What makes The Splendid Scoop so great? First of all, this ebook is a steal. At only $5.97, it costs less than just one trip to your local ice cream parlor but you’ll be enjoying it for far longer and without derailing your healthy diet. Click here to learn more about The Splendid Scoop! Please remember that even though they are healthier than the standard version, these are all treats and should not be a major part of your diet! Also, keep in mind that this is not specifically a paleo or autoimmune protocol (AIP) cookbook. Stevia is suggested as a sweetener and nuts and chocolate are called for in some of the recipes. The good news is that the recipes are all quite flexible and Jessica gives you multiple options whenever possible to adapt them to your personal needs. This is a throw-back recipe to my childhood and always reminds me of my mother. She used to make us this after a long, hot day of horseback riding. It was the perfect mid-day pick-me-up. I love the flavor of fresh mint alongside the sweet fruit. Put the watermelon and seltzer water in a high-powered blender and blend until combined. Add stevia, gelatin, and frozen strawberries and blend until smooth.